In the Reports section of the Dashboard, go to Reports > Transaction & Activity. Once here, set the Choose Report Type filters to "All Transaction Records", set the date range filter and add any additional filters. Scroll down to view the individual transactions. 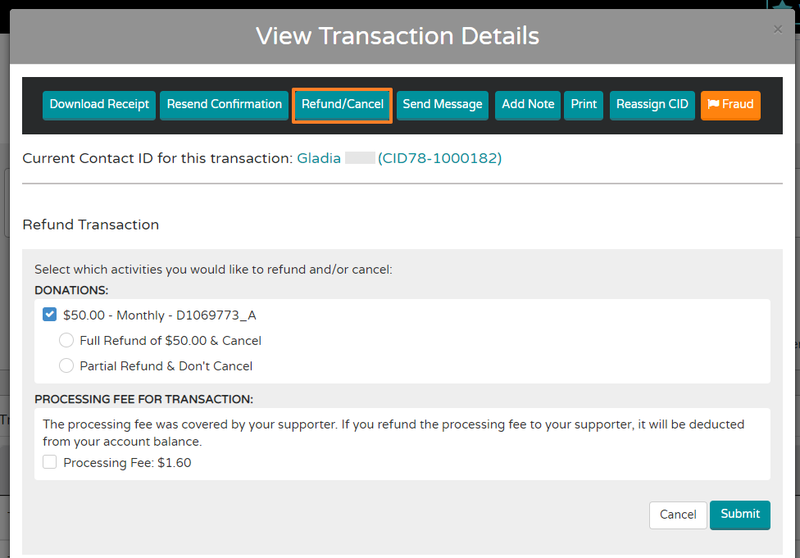 Once you find the Transaction you are looking to refund, click the Details button and then hit Refund/Cancel. Here, you can choose to do a full or partial refund. If the supporter covered the processing fee, you can also choose to refund the processing fee here. Note: If you refund the processing fee to your supporter, it will be deducted from your organization's account balance. Q: When I process a refund for a credit card payment, and the donor did not cover the processing fee, do I still refund the full amount of the credit card transaction or just the amount that CFA received? A: It depends on how your organization prefers to handle this. Transaction fees are not refundable from the credit card company. From the donor or customer perspective, they would expect to be refunded the full amount they paid. However, refunding them the full transaction will leave your organization to foot the bill for the transaction fee. So, it would be up to you whether you want to give the supporter a positive experience and cover the cost, or to be strict about zeroing out the transaction, and refund them only what was received.